Long review plus tentative checklist forthcoming. 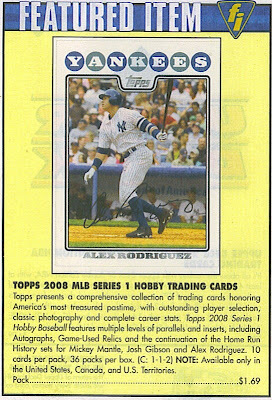 Snide comment: Topps' crack airbrushing team better get working on an Angels uni for A-Rod. Can't wait to pull that Ron Paul "2008 Contenders" insert. Although I'd probably put it on eBay for a few Federal Reserve Notes. +1 if you can point out the irony in that statement. On closer inspection, my one quibble is the Topps logo cutting a chunk out of the photo frame. That's a bit clunky. Still, this is about 250% better than the 2007 design. If you pressed me, I'd say it's probably their best since the 2004 set. 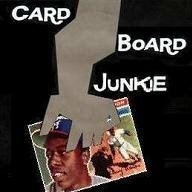 I agree with Kevin -- that Topps logo is way too conspicuous. Why couldn't they put it diagonally at the lower right corner or something? I'm guessing that the metallic looking gradient on the Topps log and the player's name represents foiled lettering. I hope so, because the gradient looks really cheesy. I disagree with Kevin about the 2007 design though :) I love black bordered cards, even though they're chip magnets. I also agree that the location of the topps logo is clunky and would go so far as to say it's a travesty. It's totally out of place and disrupts an otherwise clean design and distracts from the photo.